Sometimes, life can be like a perfect dish – just the right ingredients, combined in just the right way, at just the right time. These are moments and experiences that seem like gustatory masterpieces, lovingly prepared by a brilliant master chef. These are the stuff dreams are made of…the stuff we spend time and effort and planning and countless star-wishing to achieve. And when we do finally achieve these pockets of perfection it is amazing. Most of the time though, I think life is like leftovers. You do the best you can with what’s been dealt. That is not to say that most of the time we are just settling on what is lying around in the back of the fridge. Not at all! I think it’s more a process of taking what life puts in our path and, after assessing the situation, taking steps to make it not just bearable, but beautiful — perhaps chopping it up into a tasty fried rice, or adding a dash of pimeton de la vera and caramelized onions, or even warming it with some cream and those dried herbs you brought back from France and covering it gently with puff pastry. Sometimes, like life, these dishes don’t always turn out the way you’d like. But sometimes, they turn out so much better than their parts…an edible example of how you can take things (food, situations, people, dreams) seemingly past their prime with nothing left to give, add a little something (heat, love, a new flavor, puff pastry) and have them emerge as if a goddess from the sea…gorgeous, delicious, renewed, surprising and captivating us all. Culinary reincarnation. This is all part of my continuing mission to avoid food waste…sharing my “leftovers–turned–meals” and pushing myself to make the absolute best out of what is left behind! I realize though, at least among my immediate sphere of existence, that part of our leftovers are those doggie-bags we take away from restaurants. Unless the contents are an absolute favorite, they most likely end up tossed after a couple of days in fridge-limbo. So on the road of culinary reincarnation, let’s not forget these stragglers. 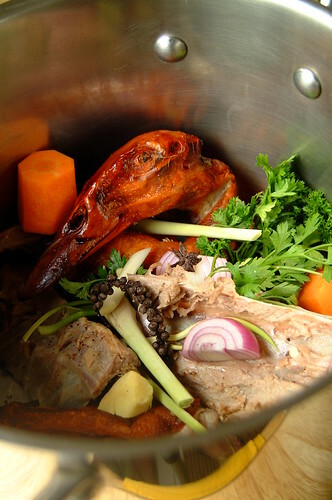 – Place everything in a stockpot and cover with water. The water should reach about an inch over the duck. – Bring to a boil and skim off any scum that appears. Reduce to a simmer and cover pot. Let the stock simmer gently for 2-3 hours. – Uncover pot and simmer for about 30 minutes more to reduce stock. Taste and either adjust seasoning or reduce further to deepen flavor. – Portion as you prefer and let cool. Use immediately or store in the fridge if you’ll be using it in a couple of days…if not, freeze for future enjoyment! Do you doggie bag the carcass of your Peking Duck? You should! It is better off going home with you and making you this delicious stock than staying at the restaurant and perhaps getting tossed out in the dump (poor thing). Besides, you did pay for it! This stock is a perfect case of creating magic from what would appear to be beyond salvage. Aside from the flavor of the duck itself, you are getting all the wonderful aromas of the spices and sauces that go into making Peking Duck! The other aromatics I used were also things in the fridge that needed using up (so feel free to be flexible with them). This makes for a deeply savory stock that you can use in so many ways. I decided to keep it simple and use it as a base for a wonton soup. With some bok choy, chopped spring onions, and cilantro, this was an intensely satisfying dinner (especially since I was feeling sniffly when I had it).